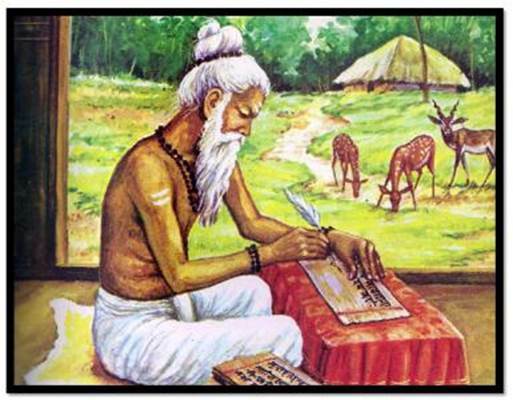 Maharshi Valmiki, the author of the great Indian epic Ramayana, was a Hindu sage who lived around the beginning of the first millennium B.C. He is referred to as the 'adikavi', the original creator of the Hindu 'sloka' - a verse form in which most of the great epics such as Ramayana, Mahabharata, Puranas, and other works are composed. He was a Brahman by birth belonging to the lineage of Bhrigu. Fate consigned him to a family of robbers which brought him up. Accidental contact with the Saptarsis - the Seven Sages and with the sage Narada changed his life. By the repetition of Ramanama or the name of Ram, he attained the supreme state of a 'maharshi' or great sage. Since a 'valmika' or an anthill had grown over his body during his long period of austerities and poised state of penance, he came to be known as Valmiki. When the mythical sage Narada came to his hermitage, Valmiki who received him with due honor, posed a question - who was an ideal man? The reply came from Narada in the form of Samkshepa Ramayana which formed the foundation on which the magnificent 24,000 verse edifice was built by Valmiki. Then, immersed deep into this story, Valmiki left for the river Tamasa with his disciple Bharadwaj. The pleasant and placid river reminded the seer of the mature and modest quality of his hero. He visualized a pure and pious man's mind reflected in the deep waters. In the next instant he witnessed a heartless hunter mercilessly killing a male bird that was in love with its mate. The piteous wailing of the distressed female moved the heart of the sage so much that he spontaneously uttered a curse on the hunter. However, this curse came out of his mouth in the form of a 'sloka', a perfectly metrical composition, which surprised the sage himself: "No - You shall not command any respect in society for a long time as you have shot dead an innocent bird engrossed in love". The sage had turned into a poet. His powerful emotions found equally powerful medium for their manifestation. It was a spontaneous outburst of his inner voice motivated by divine will. When he returned to his hermitage, Brahma (the fourfaced God, the creator), appeared to him and commanded him to compose an epic poem on the story of Ram as he had heard it from the great sage Narada, in his newly discovered metre. He also gave him the boon of the visions of all the incidents and the revelation of all the secrets connected with the story. Accordingly, Valmiki composed the epic, named it The Ramayana - the way or the conduct or the lifestory of Ram - the story of Ram's march in search of truth and righteousness. He is one of the first sages whose hermitage Ram visits along with his wife and brother on his way to Chitrakoot after leaving Ayuodhya. Valmiki welcomes them with love, affection and reverence and utters just one word 'asyatam' (be seated). He feels honored when Ram accepts his request and sits a while. The other occasion is when Ram banishes Sita, it is Valmiki that shelters her and rears up her twin sons Luv and Kush. When they recite the epic poem in his royal court, Ram invites Valmiki and requests him to bring Sita along so she can prove her chastity before the elders and sages. Valmiki is offended yet keeps his composure and says Sita would comply with Ram's wishes for he is her husband. While presenting Sita in the Mandapa (prayer hall) Valmiki utters words that highlight the penance and perseverance which Valmiki practiced his entire life. "I am the tenth son of the sage Prachetas. You belong to the great dynasty of Raghu. I do not remember to have uttered any lie so far in my life. I say that these two boys are your sons. I performed penance for thousands of years. I shall not accept the fruit of all my penance if there is any blemish in Maithili (Sita). I never entertained any ignoble thought, I never wronged any person, and I never spoke any vulgar word - I shall derive the benefit thereof only if Maithili is void of sin." Valmiki was truly a Maharshi. I Panduranga Rao describes Valmiki in these words: "He was purity, penance, benevolence and meditation personified and the sole object of his dedication and contemplation was Man, a man leaves his selfish existence and lives for others identifying himself with the composite culture of the cosmic creation." The only work available of the great sage-poet, The Ramayana, has established the poet's timeless fame.